The longest-running play in West End history is written by a woman. The Mousetrap’s late writer Agatha Christie also has a second play, Witness for the Prosecution, now in its second year, in the former council chamber at County Hall on London’s South Bank. But, elsewhere, male playwrights have historically long held sway over Theatreland. In fact, it has not been uncommon for The Mousetrap at certain points to be the only current West End play written by a female playwright. Recently, critic Victoria Sadler has been keeping a running tab on London’s leading producing theatres. Her report of 2018 – posted last September, but when the theatres had all mostly announced their plans for the rest of the year – revealed there were still substantial inequalities. But changes do appear to be happening. And activism – like that shown by Sadler – is helping. After artistic director Ed Hall was taken to serious task for the lack of female representation at Hampstead Theatre in a previous edition of Sadler’s survey, last year saw four out of six shows on its main stage being written by women, and six out of eight shows in its studio space Hampstead Downstairs. At the Young Vic, the programme straddled two artistic directors – with David Lan programming Fun Home (by Lisa Kron and Jeanine Tesori) and Kwame Kwei-Armah opening his tenure with Twelfth Night, in an adaptation scored by Shaina Taub, which was followed by Danai Gurira’s The Convert, making three out of five main stage shows written or partly written by women. At the Almeida, seven plays ran across the year – two of them revivals (Shakespeare’s Richard II and Sophie Treadwell’s Machinal) and five UK or world premieres, two of which were by women (Ella Hickson’s The Writer and Clare Barron’s Dance Nation). So, overall men outnumbered women four to three. The Almeida is, however, about to open Anne Washburn’s Shipwreck – and next month is transferring its earlier production of Washburn’s The Twilight Zone to the West End’s Ambassadors Theatre. Of eight plays on the Royal Court’s main stage, half were by women, but Sadler notes that two of them had much shorter runs than usual; while in Jerwood Theatre Upstairs, only three of eight plays were from women. Sadler is right that there’s an ongoing inequality. And, as she notes, it doesn’t necessarily tally with the gender of the person at the top: Vicky Featherstone is at the helm of the Court, and Sadler also cites Josie Rourke at the Donmar, who during her soon-to-end tenure as artistic director had at that time programmed only two original plays by women across the eight years she’s been there – Abi Morgan’s Splendour and Amy Herzog’s Belleville. She has since programmed a third: the run of the UK premiere of Lynn Nottage’s Sweat, which has just ended, wasn’t programmed yet at the time Sadler published her survey. Sadler’s survey includes only one unsubsidised theatre, the Old Vic; and while it could be argued that subsidised theatres have a bigger responsibility to represent the world as it is and all the taxpayers that help to fund it, it is notable that the commercial theatre is now increasingly taking risks on female playwrights, albeit only after runs in other theatres first. Laura Wade’s Home, I’m Darling, transferred earlier this week to the Duke of York’s – the same theatre that once hosted Wade’s most famous play to date, Posh – while Morgan Lloyd Malcolm’s Emilia is set to transfer from Shakespeare’s Globe to the Vaudeville next month. Emilia also has an all-female cast and creative team, while Home, I’m Darling is led by a creative team of mainly women (apart from sound designer Tom Gibbons). These are also joined by the aforementioned The Twilight Zone, and they will help to fill the gap left by the imminent departure of Natasha Gordon’s Nine Night, which transferred from the National to the Trafalgar Studios. 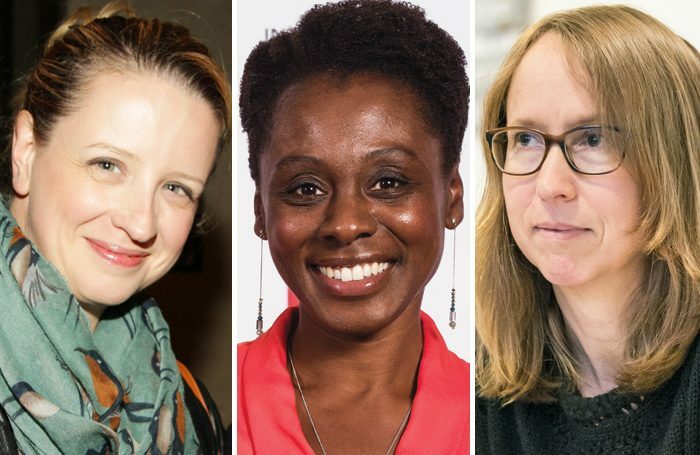 It’s exciting right now that so many women playwrights are getting exposure in the West End – and the opportunity to earn some real money from their work in the process. And about time too.